For all of our frequently asked questions about the People tab, check out this guide. This page is a collection of the most frequently asked questions for the 'People' page functionality in Deputy. How can we discard employees? Ensure that the discard employee does not have any active time sheets other you will receive an error message. 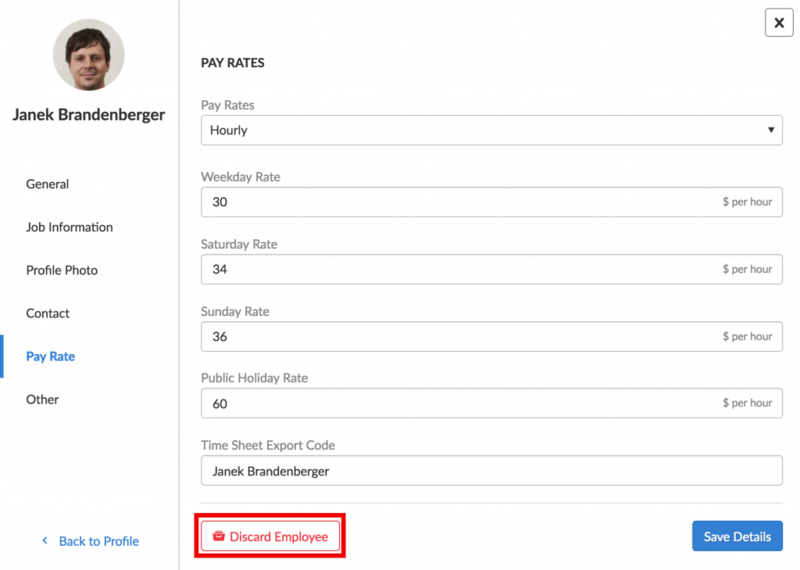 Once you click discard the employee will be removed from your roster and be categorized as an inactive employee meaning you will not be charged for them in the future. How do I reinstate employees? To reinstate a discarded employee navigate to the people tab and select the filter drop down on the top left and in the status option select 'Discarded'. Once this option is selected you will receive a list of all discarded employees, simply locate the one you wish to reinstate and click view. In the profile menu, you will be able to see the reinstate button on the top of the screen. Clicking this will reinstate the employee and allow them to log back in and use Deputy once again. I can’t discard an employee. Sometimes you will be unable to discard an employee, usually, the main cause of this is because the employee is still rostered on. To discard an employee you first need to remove all their shifts from the schedule and ensure they are not currently on shift. Once all their shifts have been deleted or reassigned you will be able to discard the employee. If you are still facing problems discarding an employee please contact our helpful 24/7 support team. Can I discard multiple employees in Bulk action? Currently, there is no way to bulk discard employees within Deputy. We are currently hard at work to update the People management page of Deputy with more user-friendly options so stay tuned! Is there a way to permanently delete an employee? Currently, there is no way to permanently delete employees within Deputy due to security reasons as the employee might require their past timesheets which they will be unable to obtain if their record is permanently deleted. Can we sort the listing by preference (last name, access level etc.)? Currently, within in Deputy, there is no way to filter the employees by last name, access levels etc. We are currently hard at work to update the People management page of Deputy with more user-friendly options so stay tuned! How can we add/import multiple people? To add/import multiple people first navigate to the people tab and select add people. In the drop-down select the Add/Import multiple people option. 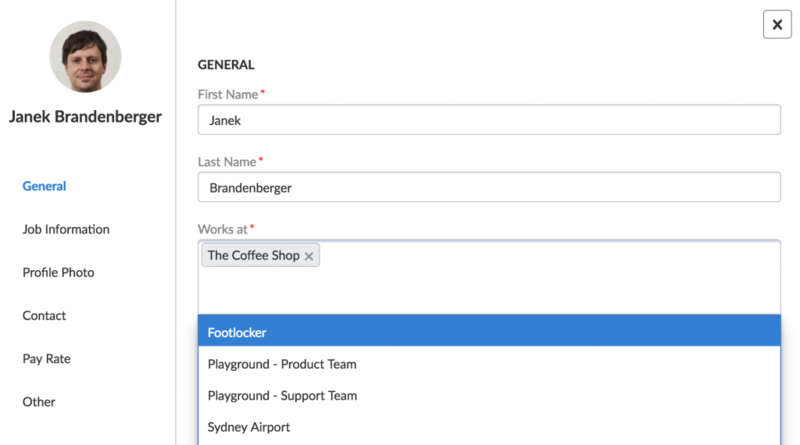 In this page first, select which location the new employees will work at, then choose if you would like to import your employees from a connected service (Xero, ADP, Quickbooks, NetSuite, Gusto, Myob, Wage easy or Excel) select the relevant options and follow the onscreen prompts. Once the employees have been successfully added the employee list will populate with your selected employees. You can select which employees to add here and remove any unnecessary employees. Alternatively, you can simply add as many employees as you desire and add them to your organization in bulk. How do I view all pay rates? To view all pay rates for your employees simply navigate to the people tab, and click the also show drop-down. Here you can see which employees are on award rates, which employees are on entered rates, and which employees are synced to Xero (and when they were last synced). How do I sync employees to Xero? 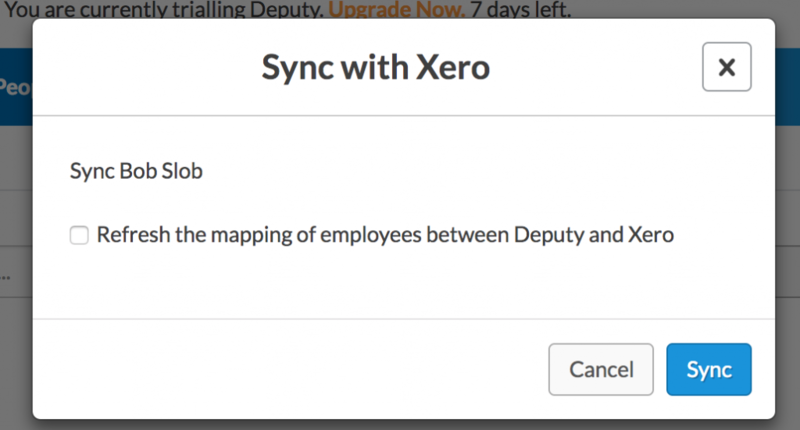 To sync your employees to Xero first ensure that your Xero is connected to Deputy via the location settings. 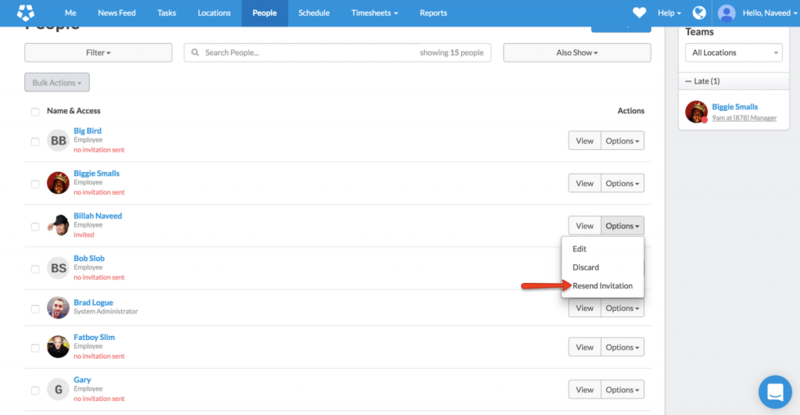 Once your Deputy is connected to Xero navigate to the people tab select the employees that you wish to sync and click the bulk actions drop down. 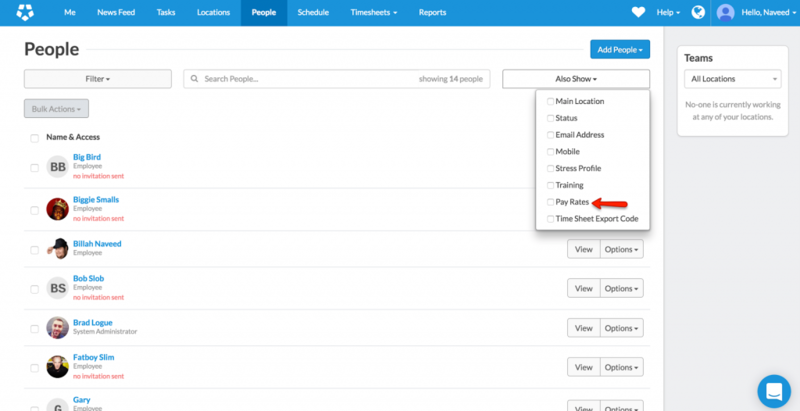 From this menu select sync with Xero and you will get a notification confirming the employees you are syncing. The sync with Xero button will be greyed out if you have selected an employee who is using pay rates from the Deputy awards library. 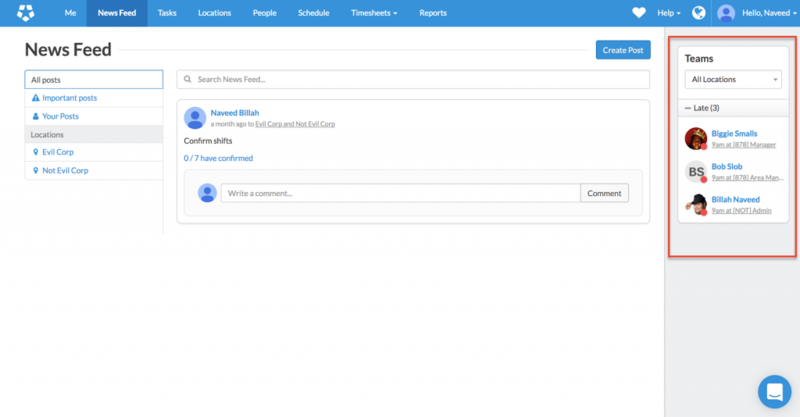 Simply click sync and your employees will start syncing with Xero. Due to Xero’s API limit sometimes employees will not sync on the first attempt, so always try a second time to see if it syncs. When the employees are synced you will get a new notification on the bottom right of Deputy asking you to make sure to reapprove the synced employees timesheets. If syncing employees fails please contact our helpful 24/7 support staff who will assist with getting your employees connected. I can’t add an employee. It says the email address has been used. Typically when you add an employee and get an email has already been used error it means that someone within your pre-existing employees is using that same email. Make sure that it is not the same as another employee’s email. If there are no employees currently employed that share the same email address ensure that a discarded employee does not also share this email. Can I assign multiple pay rates to the employees? Here you can create separate pay rates for each area. 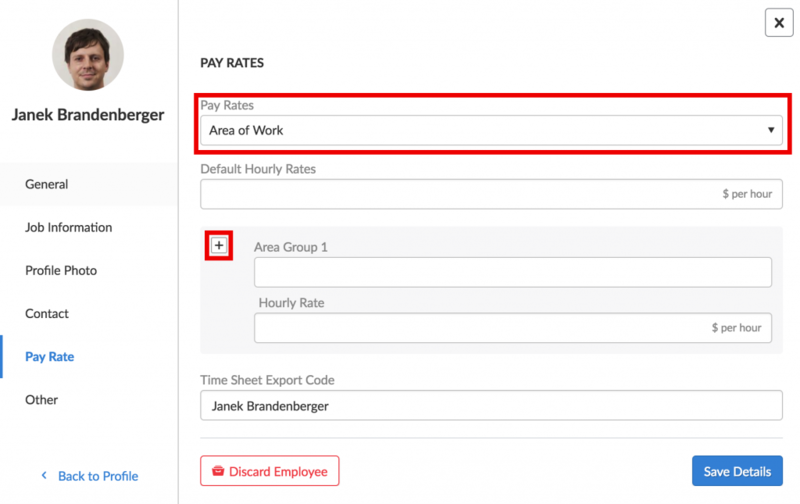 IF YOU USE THIS METHOD TO ASSIGN MULTIPLE PAY RATES YOU CAN NOT EXPORT THE HOURS/RATES TO PAYROLL SERVICES. You can also speak to our Customer Support team, who can discuss with you your needs and how to work towards getting these implemented into your business. How can I check all discarded employees? To view discarded employees navigate to the people tab and select the filter drop down on the top left and in the status option select 'Discarded'. Once this option is selected, a list of discarded employees will appear. An invite can only be resent to an employee who has not yet accepted their invitation to join a business. To resend an invite to these employees simply navigate to the people page and select option to see the resend invite in the drop-down. Why can't I resend an invite? If you are unable to resend an invitation to an employee it is because they have already accepted it in the past. In this case, the employee will need to use the forgot my password function to regain access to their account. If your employee is still having trouble gaining access to their Deputy account please contact our 24/7 support agents. How can I see employees working on each location? Here you can also filter by location to see who is currently working at each location or who is late. How do I know if a staff has accepted the invite? / What is the difference between invited/employee? On the people tab you can view which staff have accepted the invite to join Deputy. In the above, you can see the first employee has been “invited” this means they have yet to accept the invite but it has been sent to them. The second employee has “no invitation sent” meaning that there has been no invitation sent to them yet. The third employee has no red text under their name, this indicates that they have received and accepted the invitation to join Deputy. Is there an option to create custom roles/job titles for employees in Trial and Premium? Currently with the Trial, Premium and Flexi versions of Deputy you are unable to create custom roles and job titles. If you wish to create custom roles you will need to contact our support team who can walk you through our custom role process. Please note, the creation of new titles may incur a $250 per hour fee. Why can I not edit the email address and phone number for the employee? If an employee has already accepted their invite you will be unable to edit their personal details for security reasons. These details can only be changed by the employee themselves. Can I restrict my employees from seeing each other’s contact details? 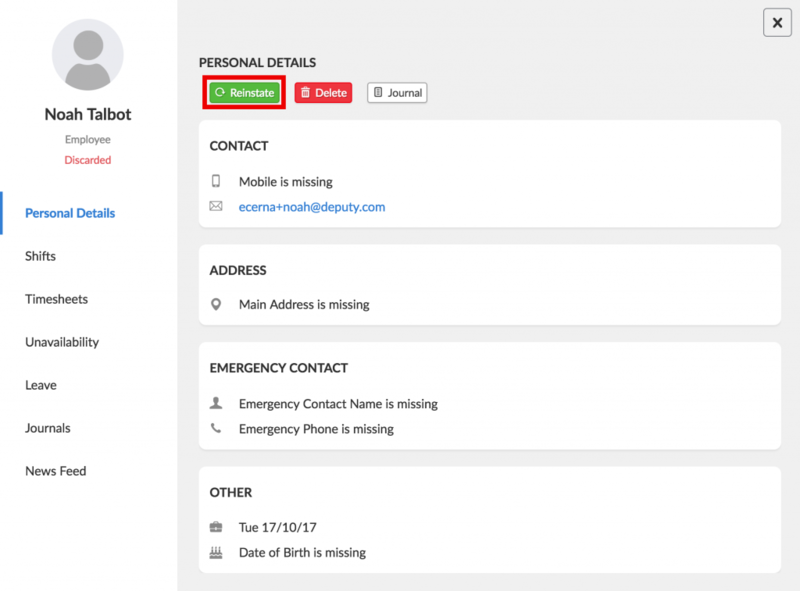 Any employee that is assigned as a supervisor or higher will be able to view employees’ contact details. If an employee is set as an employee they will not have access to the people tab meaning they do not have the ability to view other employees contact details. Can I not be billed for a temp user? If a temporary user has been assigned shifts or clocks in you will be billed for these users as they are classified as active users. An Active User is defined as the system admin, an employee who has accepted an invite/logged in, the shift has been published, timesheet submitted, or performed management functions such as scheduling, exporting payroll information, managing tasks, creating journal entries or reviewing reports. Can I view who has timesheet export codes? To view all timesheet export codes for your employees simply navigate to the people tab, and click the also show drop-down. From here select Timesheet Export code and your people list will be updated with the employee’s timesheet export codes if they have been set up. How can I add an employee to multiple areas? You can assign an employee to multiple locations by editing their profile and adding the location to the works at the module. To assign an employee to multiple areas however this can not be added to their profile directly and you will have to assign them to these areas when creating the schedule.